Thanksgiving is next week and I’m not flummoxed about what to fix: I’m a true admirer of tradition so I’ll stuff a fresh turkey with dressing that contains only bread cubes, celery, butter, water chestnuts, and fresh herbs and spices. I’ll baste it with more butter as it roasts in the oven, and then I’ll be profoundly thankful to share and eat it. I’m not a huge fan of creative changes to standards recipes. Feel free to enjoy baked tofu and cauliflower, but I’ll choose the real mashed potatoes, thank you. Bon Appétit, http://www.bonappetit.com, always offers alterations to traditional holiday dishes. A current article includes recipes for cranberry wasabi (nope) and a red wine gravy reduction over a popular green bean recipe (double nope.) My only wine reduction will come from my glass into my mouth. I admire people who can concoct tantalizing new dishes and incorporate different ingredients to create new, delicious recipes. I’ll even try some vegetarian, gluten-free, dairy-free, sugar-free, low-carb, non-alcoholic, and low-fat meals, but please don’t criticize me when I finish my customary Thanksgiving feast with a platter of warm pecan pie with soft ice cream and a glass of wine. I just want to remain true to my heritage. For Christmas Eve, I always prepare prime rib, rubbed with curry, fresh garlic, ginger, and course black pepper. I serve it with poppy seed potatoes, as I have for the past twenty years. There won’t be any deviations from these two recipes, but others are welcome to bring something new and fancy. We’ll enjoy every bite. I get a bit emotional around the holidays when my family comes together for meals, and this year we’ll have an empty chair at the table. 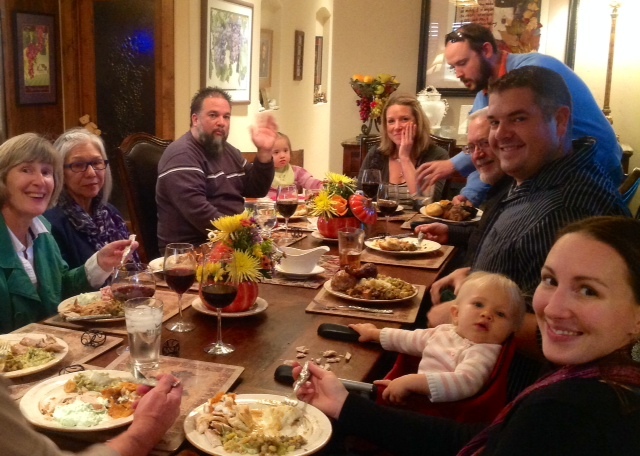 But there will be commotion at the kid’s table, and the adults will vie for the last turkey leg. It’s traditional. Tradition is priceless. Besides, if you changed those recipes you’d never hear the end of it. There are few things in life you can absolutely count on. Family tradition is an anchor that gives us all something to hang onto, even when there is an empty chair at the table. I’m with you. I’m a traditionalist when it comes to holiday dinners. I’ll save the experiments for some random Sunday afternoon. This one will be a tough holiday season for you and yours. You’ll get through it, though — have another glass of wine or some more potatoes. Have a great Thanksgiving, Elaine. Your mom will be with you because she never leaves you. You probably hate hearing that by now, because honestly it’s nothing like having her with you, right? But not knowing how to comfort you better, that’s all I have. I’m sure she’d want you to continue this tradition, however you choose. Her love is eternal. And you, through your writing, are a wonderful person that she would be very proud of. So that empty chair will be difficult, but through you she lives on. As for the cooking? I am not a cook, but love a good Thanksgiving meal, no matter what it is! As long as there’s good conversation and a lot of love. Traditions, no matter what they are, make the holiday all the richer. Wishing you only the best as you move through your first Thanksgiving without our mom. My mother, an avid follower of all things Julia Child, fed us like kings and queens when I was growing up. I, on the other hand, prepare a mean appetizer platter while I fondly remember her and thank her for the memories. May your Thanksgiving and Christmas holidays be rich with good food, laughter, and the memories be so vivid that seat doesn’t feel so empty. Knowing you, you will come up with a meaningful new tradition revolving around that empty chair 🙂 Wishing you and your family a very happy holiday. I am with you!! Haul out the turkey! Give me some mashed potatoes, gravy and sweet potatoes. Heaven help the person who tries to get me to change the menu. Want to cut back? Stay the heck away from me!! !